Thursday March 17 1910 I went to town early this morning to set for the negative of a picture. I got some curtains that I did not bring home. I got some carnations for Eugene and brought down to him and took the car there I got dinner so Will went to look at roads. I did a big washing and a lot of cleaning up. To bed early. 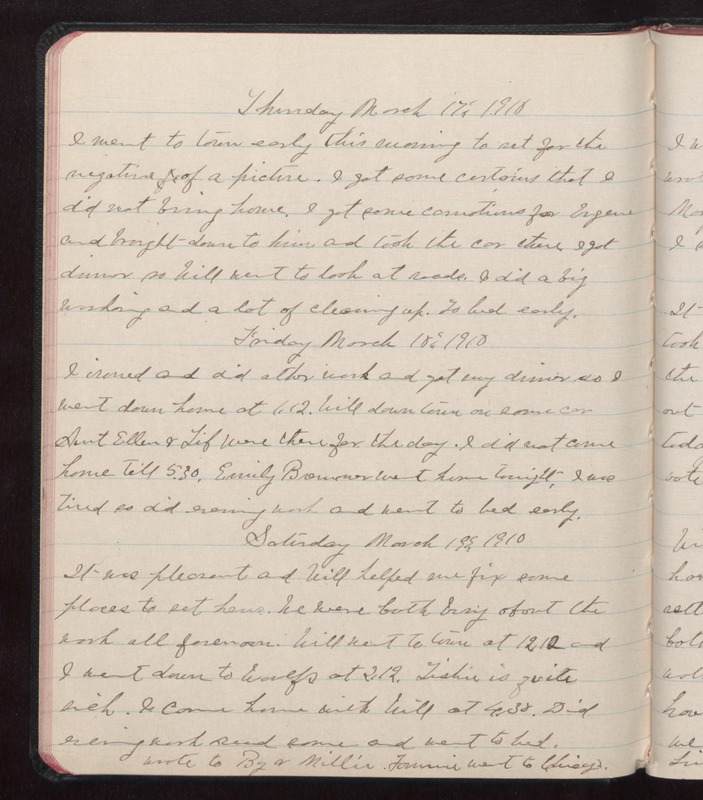 Friday March 18 1910 I ironed and did other work and got my dinner so I went down home at 1.12. Will down town on same car Aunt Ellen & if were there for the day. I did not come home till 5.30. Emily [Breimer?] went home tonight. I was tired so did evening work and went to bed early. Saturday March 19 1910 It was pleasant and Will helped me fix some places to set hens. We were both busy about the work all forenoon. Will went to town at 1212 and I went down to Woolfs at 2.12. Tishie is quite sick. I came home with Will at 4.38. Did evening work read some and went to bed. Wrote to By and Millie. Fannie went to Chicago.